Cara Sweeney is your average teenage valedictorian in any high school, but the only difference? She’s been picked to host an alien exchange student from the planet L’eihr. One of only three people to be picked in the world for this first exchange, Cara is not only shocked but a little excited to meet these aliens who share almost the same DNA, and whom saved her mum from cancer with their advanced technology and medicine. The L’eihrs are so advanced that they’ve actually bred out the incompatible traits that they believed would hinder society. These include violence, gluttony and even emotions, just to name a few. Aelyx, the exchange student, and his generation are actually clones of previous L’eihrs that have been brought back due to their superior genes. But just because they’re far more advanced, it doesn’t mean they’re perfect either. Due to the elimination of emotions as a necessary trait, the previous generation of L’eihrs have realised that they’ve become much too docile and emotions were the main spark for the creativity that led to their advanced inventions. Realising this, they have come to Earth to negotiate peace and an alliance that would benefit both races. Of course with the L’eihrs on Earth comes widespread paranoia. Landers’ portrayal of human’s paranoia is so spot on, the actions taken by the anti-L’eihr activists had me so riled up throughout the novel. And it’s sad to think that these reactions by fictional characters are exactly the same reactions you will probably get if aliens ever came and made contact with Earth. Even today, people are still acting the same way in regards to something as simple as gay marriage. Paranoia or their inability to accept change can really see people doing crazy things that are not only inhumane and cruel – but completely unnecessary. I think Landers’ portrayal of the human race in her novel really highlights the instability of our world today. The fact that she managed to capture it in a novel that doesn’t mean to preach this information to you makes it resonate so much more, and I hope readers of this novel can learn from it and will never stoop so low as to resort to violence. Moving on from that tirade, Landers’ book not only manages to capture some of the issues existent today, but her characters also manage to capture my heart. Cara is portrayed so realistically I felt like I knew her personally. The things she goes through seemed harsh but I could see them occurring in real life. Not only is she a strong and independent character, I enjoyed the fact that Landers didn’t try to make sure everything worked out perfectly for her. She had to go through so many obstacles and yet in the end she still hasn’t won entirely. But the events she was put through really developed her as a character and I was rooting for her and Aelyx the whole time. Aelyx (or pronounced A-Licks) was also another well-drawn out character. Apparently he has no belly-button and only four toes! I still can’t get over that haha. A very stoic character at first, but as the story progresses and he gets to know Cara and her family more, Aelyx’s emotions begin to develop. He becomes an entirely different character by the end. He and his three friends that were chosen on exchange were also hiding a secret from their superiors. Aelyx’s generation of L’eihrs hated the idea of an alliance with Earth as much as the humans did, and had planned to sabotage the exchange and return home as soon as possible. But what he discovers on Earth changes his mind altogether, and as the story progresses, Aelyx develops a wide range of emotions and changes his character for the better. 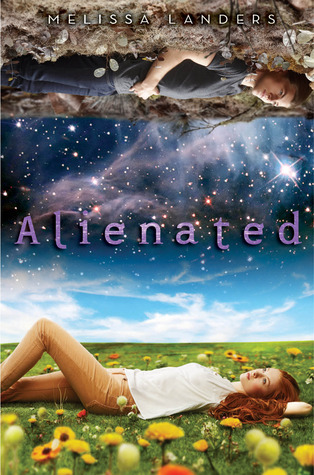 Alienated is such a welcome surprise. I admit I didn’t expect to love it as much as I did, picking it up only as a light read between studying. Not only did it distract me from actually studying, but I became so absorbed in this well-written novel I could barely put it down in the end. This novel really takes you on the rollercoaster journey of emotions, and I recommend it to anyone looking for a light science-fiction read within the young-adult genre. I can’t wait for the next book! Thank you to Disney-Hyperion for providing an eARC in exchange for an honest review.